Multinational HR and talent practitioners are increasingly introducing gamification elements to enhance their selection strategy, This stems from a desire to differentiate their hiring process, engage candidates and boost their employer brand. 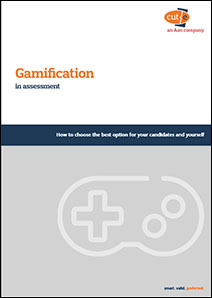 However, in the excitement around gamification, it is easy to forget one important detail: the real purpose of assessment is to measure the job-relevant capabilities of candidates in order to recruit the right people. This free whitepaper distinguishes between games (which are primarily used for pre-application attraction), gamified assessments (proven psychometric instruments which feature game-style elements to make them more engaging) and game-based assessments (purpose-built games which assess the user’ behaviour while ‘playing’ the game). Each can be used alongside traditional psychometric assessments. Download the white paper to review the latest research evidence on gamification, as well as seven practical steps to help you choose and implement the right solution – complete the form below.